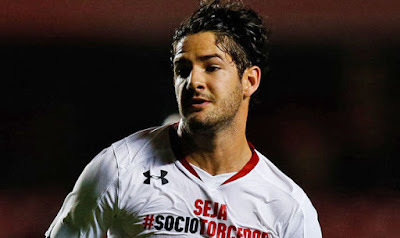 PATO: Chelsea to seal £11m deal within hours - What a signing he could be for us! Despite Guus Hiddink's firm denial that Chelsea will not be doing any transfer business in this months window, We are to expect the reported £11m signing of 26 year-old Brazilian Striker Alexandre Pato literally within hours. So what has happened to Pato having burst onto the scene at AC Milan as an 18 year-old? Well for four seasons he had a prolific goalscoring record and was one of the hottest properties in Europe. However, his final two seasons in Milan were blighted by injury and he scored just one goal in fifteen appearances. Pato joined Corinthians back in Brazil in the 2013/14 season and followed that with a loan move to Sao Paulo for two seasons. In that period he scored twenty eight goals in eighty-nine appearances which isn't too bad. The key here is the fact that he seems to have gotten past the injuries that had plagued him at the end of his career in Italy. A natural finisher and still only young at the age of 26, Pato still has plenty to offer and with goals like he has scored below, at a fee of only £11m, he could prove to be a fabulous signing for Chelsea! Despite the qualities Diego Costa has and what that offers Chelsea, I still firmly believe that someone who is a natural finisher would really, really flourish at our club, especially with the way we play these days. You look at the video above and he IS quality, his movement, his pace, his awareness but it's his ability to finish and score all kinds of goals that really stands out - with both feet too! There will of course be people that have their doubts about his signing. Some will give two examples of strikers who have come here with big, big reputations that never quite cut it, were never good enough for us in Fernando Torres and Radamel Falcao. At the end of the day we want to see strikers put the ball into the back of the net and neither of them did that enough. Let's face it, we need goals more than ever to get us out of the predicament we find ourselves in with all this talk of relegation being a realistic possibility. Could Alexandre Pato at a cut price £11m be the man to get them for us and become another cult hero up front for Chelsea? Only time will tell but expect his signing to be announced ASAP!